A compound found in coriander and ginger may help protect against the negative effects of radiation exposure. The findings are reported in Journal of Radioanalytical and Nuclear Chemistry. Complete prevention of DNA strand breaks by linalool irradiated after 10 Gy of X-ray. Linalool may be used as a radioprotector or radiorecovery agent during both planned and unplanned radiation exposure… Further studies will be needed for radio-protective effects of a variety of monoterpenes. (Okayama, 2nd October) A compound found in coriander and ginger may help protect against the negative effects of radiation exposure. The findings are reported in Journal of Radioanalytical and Nuclear Chemistry. Plant extracts have long been used for food, cosmetic and medical purposes, from creating drugs to treat serious diseases to essential oils for relaxation and stress-relief. One group of compounds that occur naturally in oils derived from flowers, leaves, fruit and bark are called monoterpenes – these have been used for centuries to create perfumes and essential oils. In recent years, scientists have become increasingly interested in monoterpenes because they are capable of scavenging ‘reactive oxygen species’ (ROS) in the body. ROS molecules are a natural product of the metabolism of oxygen, and play key roles in cell signalling and other biological processes. However, at times of stress, or for example when a patient is exposed to ionizing radiation therapies for the treatment of cancer, ROS levels can rise dramatically and become toxic to the body. Excessive ROS can result in single and double DNA strand breaks, leading to the death of healthy cells. Now, Toshiro Ono and co-workers at Okayama University, Japan, have investigated three different monoterpenes – thymol, linalool and menthol – to determine their protective effects on cells when exposed to X-ray irradiation . The researchers used EL4 cells – a mouse lymphoma cell line – to see if cell proliferation was affected by X-ray irradiation when the cells had been treated by one of the three monoterpenes. Of the three, linalool, which is found in common plants such as ginger, coriander and lavender, showed potent radio protective activity, with 80 per cent of cells remaining viable after exposure to radiation. Linalool actively scavenged ROS generated by the X-ray treatment, and was also found to prevent DNA strand breaks. The team found no evidence that thymol or menthol provided radioprotection. 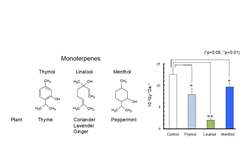 Alongside protecting against X-ray damage, the three monoterpenes also exhibited anti-cancer activity, suppressing EL4 cell growth after 24 hours incubation. Linalool could, therefore, provide dual benefit to cancer patients by reducing damage from ionizing radiation therapies and helping to fight cancer cells. One of the reasons that people feel so unwell after exposure to high doses of ionizing radiation (X-rays and gamma rays) is because the radiation triggers the over-production of reactive oxygen species (ROS) in the body. These molecules can cause significant DNA damage and rapidly kill cells. While a number of plant extracts have been found to exhibit radioprotective ability by scavenging and destroying ROS, most drugs made from these extracts are quite inefficient once they are administered to patients, and some have unpleasant side effects such as severe nausea and acute hypertension. Scientists are keen to find alternative, safe options for use as components in drugs that limit the effects of radiation poisoning. Monoterpenes, naturally-occurring hydrocarbon molecules that are low in toxicity, may help fill this gap. They have been used as safe components in the food, cosmetic and pharmaceutical industry for many years. This study, by Toshiro Ono and co-workers, highlights the potential that one monoterpene, linalool, may have as a radioprotective agent. Ono and his team will continue investigating linalool’s properties, and further experiments will be conducted to analyse other monoterpenes to find out if they have similar radioprotective qualities. Ken-ichi Kudo, Tadashi Hanafusa and Toshiro Ono. In vitro analysis of radioprotective effect of monoterpenes. J Radioanal Nucl Chem (2017) 313: 169.